Is Slip in Homeowner Costs a Trend? WASHINGTON — A big reason that inflation measures that exclude food and energy have decelerated lately is a slowdown in growth in the government’s measure of the cost of owning a home. Economists have been wondering if that is a durable trend or a temporary statistical quirk. The uncertainty is a reason that the Federal Reserve has said that a "sustained moderation" in inflation hasn’t been "convincingly demonstrated" and thus still sees inflation as its principal policy concern. New research at the Bureau of Labor Statistics suggests the slowdown in homeownership costs reflects fundamental features of the housing market, and thus is likely to persist. That’s a potential source of comfort to the Fed, which has been briefed on the BLS’s findings. “It’s something that, behind closed doors, has got to be making them more confident that the improvement in core inflation can be sustained,” said David Greenlaw, economist at Morgan Stanley. In producing the consumer-price index, the BLS measures homeownership costs not directly, but with “owners’ equivalent rent.” Essentially it estimates how much more- or less- a homeowner would receive for renting out his or her home. Owners’ equivalent rent, or OER, makes up a whopping 24% of the consumer-price index, and an even larger share of the core index. It is a smaller but still substantial share of the price index of personal consumption expenditures, which the Fed prefers to the CPI. The government’s measures of owners’ equivalent rent and a separate measure of rents actually paid by those people who actually rent, rather than own, are based on a sample of thousands of rental units across the country. The two tend to move together. But sometimes they diverge. This is such a time, sowing skepticism of the measures. In the 12 months through May, rent rose 4.4% and OER 3.5%. 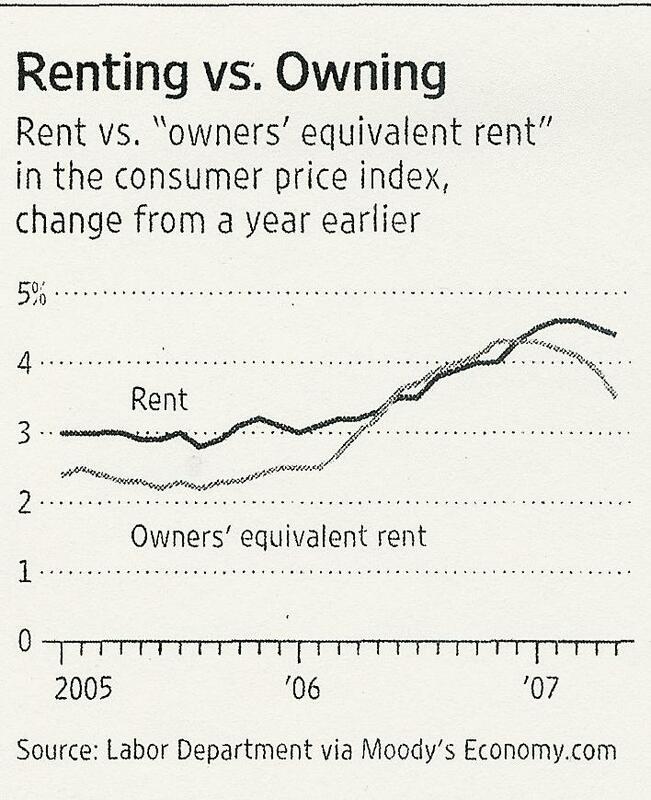 In the past three months, both have slowed: Rent rose 3.5% and OER 2.1%. details on June come today when the latest CPI is reported. The deceleration in OER is the major reason the core inflation rate has dropped. If OER were rising as rapidly as regular rents, core inflation would be higher – and the Fed would have more reason to worry. In an unpublished study, BLS researchers Randy Verbrugge and Robert Poole investigated possible reasons OER and rent have periodically diverged since 1999. They have ruled out an explanation commonly cited by other economists – the way the government separates the cost of rent from the cost of utilities, which are often included in renters’ monthly costs. A more likely explanation is a divergence in real-estate markets. In calculating rent, sample units in renter-dominated neighborhoods and cities such as Manhattan get more weight. In calculating OER, sample units in owner-dominated neighborhoods and cities like Dallas get more weight. Different trends in those areas, Mr. Verbrugge says, appear to explain much of the divergence in OER and actual rents since late 2006. Although his paper doesn’t offer an explanation why, others argue many homes originally purchased by investors have been rented out when they couldn’t be resold quickly. In the first quarter, the rental vacancy rate was unchanged from two years ago at 10.1%. But vacancies in owner-occupied homes were up a full percentage point to 2.8%, a record. The overhang of unsold homes is likely to persist for some time, and in that period many could be put up for rent. That would restrain the growth in rent in areas dominated by owner-occupied housing, and thus the OER.